Last night I had a request from my wife. She asked for burgers with grilled onions and jack cheese, and with a side of sweet potato fries. I was happy to oblige, and I added bacon. That's very rarely a bad move. OK, a burger is a burger, right? Wrong! A burger is only as good as what it's made of. My blend of choice is half sirloin and half chuck. I've found this to be a great mix of flavor and juiciness. If you can't find or identify either of these, ask your butcher. The right meat really does make all the difference. I always shoot for a final blend of about 20% fat. Lean burgers are just not good. Sorry, but that's just a fact. Not only does fat equal flavor, but it also equals "Man, this is a juicy burger!" 1 medium Yellow onion, diced to 1/2"
Combine the beef in a large mixing bowl. Use your hands to mix the meat well. Yes, it's messy. Note: You want to mix the meat just enough to combine the two cuts evenly. 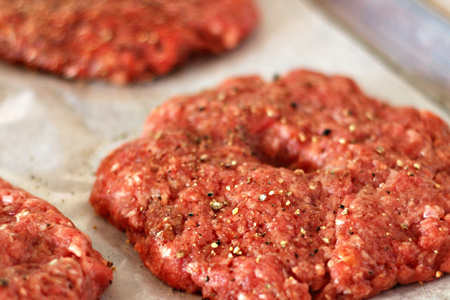 To avoid tough burgers, don't over-mix it until it goes to a pasty consistency. Divide the meat into four equal portions (I use a scale) and form them into evenly-sized patties (about 1/2" thick and six inches in diameter). Sprinkle both sides of each patty with the garlic salt and pepper. Use your index finger to put a hole in the center of each patty and set them aside. Note: The hole helps the burger maintain its flat shape, and not swell in the center and become a meatball. Heat a medium saute pan over medium-high heat. Add the oil to the pan and let it heat for one minute. Add the onions to the pan and saute them, mixing often, until they are translucent and just starting to brown on the edges. Tasty Tip: A splash of whiskey added to the onions will add another great flavor dimension. Add the cooked bacon to the pan, mix well, and remove from the heat. Start your grill and prepare for direct and indirect cooking (heat to one side) over a medium-hot fire (375-400º). Grill the burgers over direct heat for four minutes. Flip the burgers and cook them another four minutes. Move the burgers to the cooler side of the grill and top each with a slice of cheese. 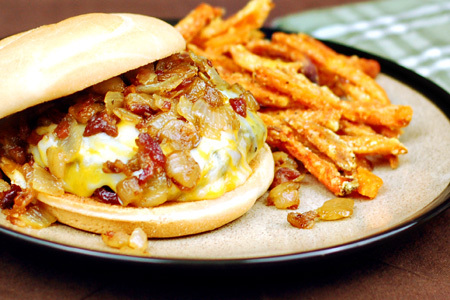 Top each burger with a healthy portion of the sauteed onion and bacon mixture. Makes my stomach growl. You do have a way with words. You get great coverage with the cheese. Is that only from putting it over to the indirect side or do you do any other tricks like tenting it with a lid or foil pan? I just notice how perfect the cheese looks. Chris - I didn't do anything special to get the cheese to melt that way. It's just a slice of co-jack that melted just right. This post is making my stomach growl!! I like to stir some Heinz 57 into the onions and marinate them for 20 to 30 minutes before I saute them. Denatures the onions a bit and really adds some flavor. One night in the restaurant one of my servers came back and asked why did that lady tell me "I'm 57"? I laughed and handed her a bottle. you didnt publish anything about the sweet potato fries! For the fries, I just deep-fried some Alexia frozen sweet potato fries.